Oh Crap, Dark Matter Killed the Dinosaur Too? Artist’s rendering of the gravity anomaly map of the Chicxulub Crater area. Red and yellow are gravity highs; green and blue are gravity lows. 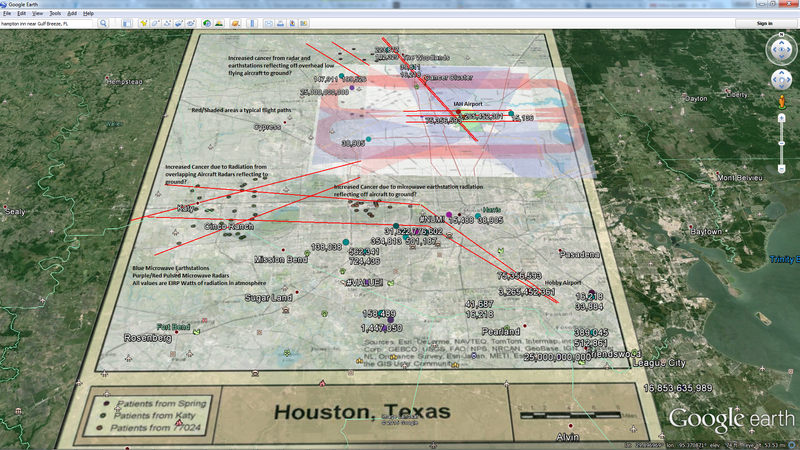 White areas indicate multiple sinkholes, “cenotes”. The shaded area is the Yucatan Peninsula. I really do believe I understand the basic behavior of these decaying dark matter strings and branes and I believe they arrive to our planet in a range of masses and sub-relativistic velocities and they clump together like bubbles in space due to their ultra high densities, gravitational attraction and radiation bubble. In cold dark space their bubble may be covered up in a layer of dust and charged particles so they hide, which, along with their sub-relativistic to relativistic velocities makes them extra troublesome to detect. They are basically orbital balls of entropy and they form strings as they interact with the dark matter at the cores of other orbital bodies. When the Earth’s environment is in a “safe” range of orbital dark(vacuum) energy concentrations, matter based life on Earth can and will flourish, albeit with the typical high energy storms and earthquakes that we experience due to our quantum gravitational field. It appears that we oscillate in and out of this safe range every thousand years or so as witnessed by the dark ages as well as some of the mini ice ages triggered by comets and such. I believe the most drastic orbital infiltration events will lead to extreme upsets. The orbiting strings and branes themselves can cause extreme low pressure upsets in the atmosphere and trigger sudden temperature drops leading to massive crop failures. Volcanic and seismic events will occur as the branes create ionization and beta decay instabilities in the Earth’s crust and mantle where they orbit. Proton and ionizing radiation will also be a problem in their path. 1) The Primary Chicxulub crater was surrounded by hundreds or thousands of additional sinkholes (cenotes). You see how they are clumped around the rim or “bubble” of that larger sinkhole. My research tells me these were created from clumped particles which entered Earth’s atmosphere at the same time as the larger particle (black hole). These hundreds or thousands of particles would have triggered the same number of extreme low pressure systems including hurricanes and tornadoes where they popped out on Earth and their orbit gradually decayed over time. The long term effect of this over months or years would be extreme condensing and cooling of the atmosphere. 2) The Earth’s core is rich in iridium. The iridium found to be blanketing the Earth during that period would be from the massive particle(s) gravitationally pulling it up from the Earth’s core and expelling it into the atmosphere over the period of months of orbits. The Bayou Corne Louisiana sinkhole struck crude oil as I mentioned in a previous entry. 3) A massive particle or particles orbiting into the same spot on Earth for a period of time will create magnetic and gravitational anomalies in the Earth since they have the most intense gravitational attraction to matter of anything in this universe and actually tear it apart. In effect as I have said before, I believe gravity is linked to the decay of matter through dark matter flux. 4) Unlike a massive asteroid impact, which might instantly wipe out many species, evidence shows that many species proceeded to die out during the next few hundred thousand years. I would assume that the concentration of orbital dark (vacuum) energy remained high over that period and Earth was a very inhospitable place to live, lots of volcanoes, earthquakes, hurricanes and tornadoes and probably ionizing radiation. I am not sure what to make out of your theories. Do you have an explanation that can be put in simple words. Anyway, I have proof that Dark Matter is superfluous for explaining rotation curves of Galaxies. I think it is pretty straight forward, if you can agree that a theory must explain all observations, and that MOND is extremely good at fitting Galactic rotation curves. The proof rests on Modified Newtonian Dynamics or MOND. MOND is a non-relativistic equation, which gives the rotation curves of galaxies, using the visible mass. MOND states that there is a critical acceleration scale a0, above which Newtonian gravity is applicable, below it the gravity is defined by the geometric mean of Newtonian gravity and a0. MOND works very well at galactic scales. There are no known instances where it does not work. It is known not to work very well at higher scales, eg Cluster of galaxies. It works so well that it can explain the wiggles in the rotation curves of galaxies. It had predicted Low Surface Brightness Galaxies, before they were found out. It works very well for globular clusters and other types of sub galactic structures. It is to be noted that it is just an empirical formula, and cannot be used on much else other than rotational curves. This means it is useless as a better approximation in place of GR. A toy relativistic theory called TeVeS has been created, but it is very ad hoc, and still doesn’t explain cluster of galaxies. Now note that a theory must explain all available data. MOND “fits” a very large body of data. Because of this GR must explain MOND. Unfortunately GR is inherently local while MOND is inherently non-local. So the two are very much incompatible. Also MOND shows that Dark Matter is not required in the galactic scale. This means that GR+DM can also not explain MOND. It would be weird if DM even though it is supposed to be made of exotic particles, must anyway be distributed strictly according to the distribution of Visible mass. Since GR is incompatible and DM is superfluous to explain MOND, it follows that GR is invalid at Galactic scales. I am pretty sure if GR doesn’t work at galactic scales our understanding is very much flawed. And hence there is no point in extrapolating GR to cosmological scales. There are a couple of issues with GR for Cluster of galaxies which are undergoing collisions. The Bullet Cluster shows higher velocities than possible with GR, and Abell520 is totally unexplainable with GR. MOND is like Kepler’s laws. Kepler’s laws worked only at Solar system scales and not at Galactic scales. Similarly MOND works only at Galactic scales, but not at Cluster of Galaxies scale. Kepler’s laws were explained by Newtonian gravity. MOND must be explained by GR, and since it does not, so GR is falsified. I have a theory why nobody is accepting this falsification of GR. 1) MOND proponents are overstating the claim. They are trying to project it (TeVeS) as a replacement. This it can never be. 2) Cosmologists cannot accept the falsification. There is a saying a man will not understand a point, if his job depends on his not understanding it. The problem is that if GR falsification is accepted, there is no theory to work with. They are basically get left with the only task of searching for a new theory. I discovered this issue in 2004. MOND has been there since 1981. And has been collecting corroborating data, since then. I scour the Arxiv for suitable replacement theories every few months. At present I think Verlinde’s Entropic Gravity seems the most promising. It does away with gravity as a fundamental force and relegates it to an emergent property due to Thermodynamics of Entropy. Another interesting one is Doubly Special Relativity, which has two constants Speed of Light and Planck’s Length. It is known that these two are fundamental constants. Since GR uses only speed of light, that might be a problem with it, which manifests itself at a0. I have never read Verlinde’s theory until now but it has some similarities to my research, observations and theory. 1) Massive Dark Matter Particles, basically black hole balls of entropy are orbiting each other through this universe at a range of sub-relativistic to relativistic velocities. 3) Gravity just the flux between these balls that passes through us. 4) Hurricane Sandy was one of those balls of entropy, most likely ejected from its orbit around the sun during a CME. 5) These balls of entropy are energetic due to the fact they shred regular matter and accelerate with an ion tail. 6) These particles (balls) are triggering beta decay on Earth wherever they orbit and are collapsing matter and have triggered most all of the ice ages. If Verlinde’s theory is correct and my expanded theory/observations are correct as they apply to Earth and these orbital balls of dark matter entropy, then until all of the physicists get together and agree that this is what is happening, I am going to hold them responsible for the next fission reactor melt down due to beta decay which can happen at anytime due to these orbiting balls of entropy. As an engineer I don’t really care about some distant galaxy. I want to know what just took out part of New Jersey and may have just taken a Learjet out of the sky in Mexico. While they argue about the cosmos, the castle is crumbling. My blog is getting read by every educated Country in the world and it is not a very complicated theory, it actually simplifies things. I listened to Verlinde’s Entropic Gravity lecture and it perfectly agrees with my theory that the core of the Earth is a black hole as well as the other planets. I interpret gravity as the dark matter flux passing through us to and from the surface of our black hole and others, which is what he is stating. We are basically a holographic projection on the black hole surface of the Earth.